The seven Sprixie Princesses from Super Mario 3D World. 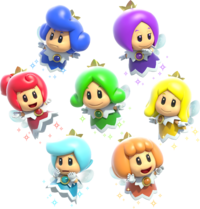 The Sprixie Princesses are a group of seven characters from Super Mario 3D World. They act as the rulers of the Sprixie Kingdom and the Sprixies, a race of fairies who play a major role in the story. The PAL release of Super Mario 3D World Original Soundtrack refers to the green Sprixie Princess as the sole Sprixie Princess and refers to the others as her followers. Due to Yoshiaki Koizumi deciding to make Princess Peach a playable character as opposed to having her reprise her usual damsel-in-distress role as how Koichi Hayashida and Kenta Motokura initially intended it to be, the Sprixie Princesses became the damsels in distress getting captured by Bowser in lieu of Peach. The green Sprixie Princess explaining her situation to the group. Bowser kidnaps the green Sprixie Princess. The green Sprixie Princess first appears when Mario and Luigi find and repair a Clear Pipe. The pipe promptly ejects a large number of items before the princess emerges. The green Sprixie Princess tells the group that the Sprixie Kingdom is in danger, as Bowser had managed to capture the other six princesses and that she had only narrowly escaped his grasp. Moments after she emerges, however, Bowser comes up through the same pipe, captures the green Sprixie Princess in a bottle, and retreats down the pipe. The group quickly follows after Bowser in order to rescue the kingdom, and they soon find that each Sprixie Princess is guarded in one of the first seven worlds' castles. Defeating the boss of the castle will reveal a Warp Box that takes the group to a room containing both the Goal Pole and the imprisoned Sprixie. Each time a Sprixie Princess is saved, she will build a Clear Pipe to the next world with either a hammer or a wrench (with the exception of the red Sprixie Princess, since she was recaptured after she was saved in World Castle (World 7) and she only helped build a rocket ship). It is possible for the player to skip saving the first and fourth Sprixie Princesses if they take the secret exits found in World 1 and World 4, respectively. Bowser recaptures all of the Sprixie Princesses at the end of World Castle (World 7). Cat Mario poses with the Sprixie Princesses after the defeat of Meowser in World Bowser (World 8). The group eventually manages to rescue the last of the seven Sprixie Princesses after defeating Bowser in his car for the second time in World Castle (World 7), seemingly the last stage of the game. However, Bowser promptly reappears, stuffs all seven princesses into a larger bottle, and flees to World Bowser (World 8), a Bowser-themed carnival area that serves as the true final world of the main game. Here, Bowser confronts the heroes after transforming into Meowser and is defeated, dropping the Sprixie Princesses in the process. The princesses then use their powers to undo all the harm done to their land before waving goodbye to the heroes as they return to the Mushroom Kingdom via a Clear Pipe. After the ending credits, the Sprixie Princesses build a rocket ship in World 1 for the player to use in order to travel to the secret bonus worlds in outer space. Since the ending of the Wii U version of Captain Toad: Treasure Tracker uses the same scene as the beginning of Super Mario 3D World, albeit with a new ending, the green Sprixie Princess appears briefly, while the other six princesses appear in the image in her speech bubble. The green Sprixie Princess winning a point in Mario Tennis: Ultra Smash. Only the green Sprixie Princess appears in her first playable role in Mario Tennis: Ultra Smash, where she is an unlockable character. Like Peach, she is classified as a Technical character, meaning that she has good ball control, but below average power. Green Sprixie Princess is the only unlockable character in Mario Tennis: Ultra Smash to have this classification. Two methods are available to unlock the Green Sprixie Princess: she can be unlocked either upon hitting at least 100 consecutive shots in Mega Ball Rally, or by purchasing her from the rewards menu for 5000 coins. Regardless of the method used, upon unlocking Green Sprixie Princess, her star version (which improves her stats) is unlocked as well. The emblem on her racket is a picture of her head (excluding mouth), and like Boo, Rosalina, and Bowser Jr., she flies to move instead of running. The Sprixie Princesses appear as an Advanced-class support spirit in Super Smash Bros. Ultimate. When equipped, the fighter starts the battle with a Fairy Bottle, referencing how the Sprixie Princesses were trapped in bottles in Super Mario 3D World. Their spirit can be summoned using a Wanda and Princess Shokora core. The green Sprixie Princess captured in a bottle. French Princesses Libella Pun with "libellule", which means dragonfly, and some female names finishing by -lla. Bowser's method of capturing the Sprixie Princesses is similar to how Link catches fairies in The Legend of Zelda series. The Sprixie Princesses' color schemes match the color schemes of the worlds they are captured in. The Sprixie Princesses' color schemes also represent the respective colors that collectively compose white light. This is further supported when Bowser combines the Sprixie Princesses' power for himself, which generates a white light. ↑ A GameFAQs topic that shows the developer's comments for the soundtrack. The comment for the track 'World 1' reads: "The Sprixie Princess and her followers have been captured by Bowser! But before you get round to rescuing them, you'll want to spend a bit of time exploring the opening World. This laid back tune is just perfect for getting your bearings." This page was last edited on April 8, 2019, at 21:47.